Sri Lanka 5-139 (Angelo Mathews 35*, Kushal Perera 33, Glenn Maxwell 2-15) beat Australia 3-137 (David Warner 90*, Adam Voges 25*, Nuwan Kulasekara 1-21) by five wickets. An excellent team effort by the Sri Lankan squad earned them a much deserved victory against Australia in the opening Twenty20 at Sydney. The Kangaroos scored 137 runs for the loss of just three wickets in the measured 20 overs and the Lankan Lions thrashed 139 runs with five wickets in hand and seven balls to spare. 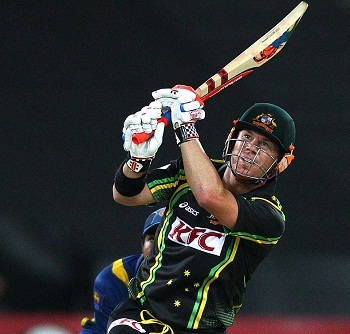 David Warner (Australia) was declared ‘Player of the match’ for his attacking unbeaten knock of 90 off just 62 balls. The first Twenty20 of the two match series was played on Saturday, January 26, 2013, at Stadium Australia, Sydney. Earlier, the captain of Australia, George Bailey, won the toss and elected to bat first but lost the opener Aaron Finch at eight runs. Shaun Marsh got together with David Warner who added 11 runs in the third over with 2 fours. The next three overs produced 11 runs as Marsh was run out for 6 and Bailey replaced him in the center. Warner hit the first six of the day in the eighth over and Bailey followed him in the next over but was caught by Tillakaratne Dilshan off Thisara Perera for 11 runs. The Kangaroos lost their third wicket at 53 in 9 overs when Adam Voges joined in with David Warner who was cruising nicely and achieved his 9th T20 fifty in the 13th over with a four. The latter hit 1 six and 1 four on the first two balls of the 15th over off Angelo Mathews and was dropped by Nuwan Kulasekara at deep midwicket on the fourth delivery at 68 runs. Warner made full use of the chance, continued his assault on the rival bowling and Voges held his end while adding useful runs. The unbroken fourth wicket partnership enhanced the score to 137 at the end of the 20th over. David Warner posted his highest T20 score by thrashing unbeaten 90 runs off 62 mere balls with 3 lofty sixes and 5 fours and Adam Voges secured his end with a composed 25. Nuwan Kulasekara and Thisara Perera were the only successful bowlers with one wicket each. Kushal Perera and Tillakaratne Dilshan opened the innings for Sri Lanka in a positive manner as they reached 45 from the first six overs with the assistance of 2 sixes and even fours. Dilshan became the first victim after scoring 16 runs in the next over and his partner Perera followed him in the eighth over for 33 off 22 balls with 1 six and 2 fours. The second wicket fell at 53 and the next two batsmen, Mahela Jayawardene and Dinesh Chandimal, departed for 8 and 5 runs respectively. The visitors were reeling at 4-69 in 10.5 overs when their skipper, Angelo Mathews and Lahiru Thirimanne associated in the center. The latter hit a couple of fours in the 12th over and Mathews got the same result two overs later. The duo enhanced the score to 104 in 15.2 overs when Thirimanne was caught by Voges off Mitchell Starc for 20. Thisara Perera walked in next as the Islanders required 32 runs from 24 balls to win the match. Mathews hit a six in the next over and got a four on the second ball of the 19th over while Perera dispatched two mighty sixes in the same over and the target was attained by piling up 139 runs for the loss of five wickets in 18.5 overs. Angelo Mathews remained unbeaten for 35 off 27 with 1 six and 3 fours whereas Thisara Perera held his end with 19 from 12 balls with 2 sixes. 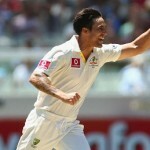 Xavier Doherty and Glenn Maxwell were the chief wicket takers with two each as Mitchell Starc claimed one wicket. Sri Lanka won the first T20 by a margin of five wickets and leads the two match series 1-0. The second and final game of the series will be played on January 28, 2013, at Melbourne Cricket Ground.